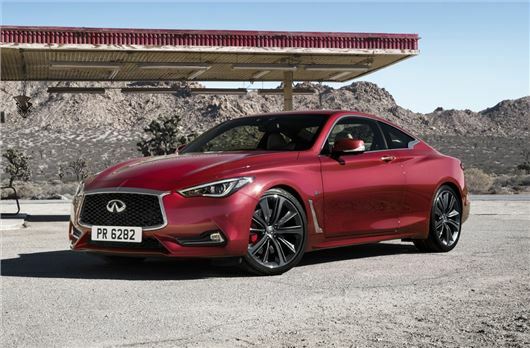 Infiniti's new Q60 will be priced from £33,990 when it goes on sale in November. Designed as an alternative to the BMW 4 Series and new Audi A5, that money gets you a 2.0-litre turbocharged petrol engine producing 208PS along with four-wheel drive. Based on the Q50, the Q60 uses the same engines and gearboxes, so expect similar claimed economy figures from the 2.0T with around 45mpg. There's no word on a diesel version yet but expect the 2.2-litre diesel to be introduced at some point, with a lower list price and far better economy too. This will be the model to rival the likes of the Mercedes C220d Coupe. The other model will be the top of the range 3.0-litre V6 twin-turbo which develops 400PS and 475Nm of torque, making it the performance Q60. Standard on all models will be a newer version of Infiniti's occasionally maligned steer-by-wire Direct Adaptive Steering, which should see it behave in a more natural manner than cars equipped with the first-gen system. To give it a premium feel, the Q60 will also get active noise cancellation while standard equipment will include touchscreen navigation, Bluetooth, DAB, leather upholstery, dual-zone air conditioning and 18-inch alloy wheels.